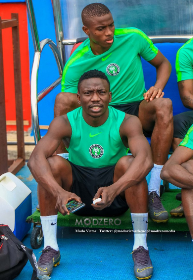 Gernot Rohr has hinted that Stoke City star Oghenekaro Etebo will be named in the starting line-up against Seychelles on Friday afternoon and wants Odion Ighalo to finish as the top scorer in the Africa Cup of Nations qualifiers. Heading into the last round of AFCON qualifiers, Ighalo is tied on six goals with JS Kabylie's Burundi striker Fiston Abdul Razak, while Red Star Belgrade's El Fardou Ben Nabouhane of Comoros has five goals to his name. ''The individual challenge is that we want to have the best goalscorer in this AFCON qualifiers,'' stated Rohr. ''For the moment we have two goalscorers with six goals, one of them is Ighalo, the other one is from Burundi. On Etebo, Rohr said : 'He did well in the training sessions on Tuesday and Wednesday. And we have good chances to see him start the game, at least 45 minutes. ''Etebo is from the area here, I think he wants to show something good to his family and friends''. If the Super Eagles final workout is anything to go by, Leicester City's Wilfred Ndidi will start as the second holding midfielder in a 4-2-3-1 formation.